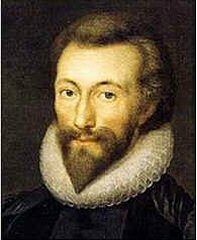 John Donne (1572 - 1631) was an English poet, satirist, lawyer and a cleric in the Church of England. He developed a style of poetry deemed "metaphysical poems," in which wild metaphors offer substantially deeper meaning than what lies on its surface. Two of his poems, A Valediction: Forbidding Mourning (1611) and Song: Go and catch a falling star are often studied in high school to appreciate his use of literary devices. Our favorite Donne quote: "No man is an island, entire of itself; every man is a piece of the continent."